Observations: Here are 2 roughly contemporaneous etchings of liberty slaying monsters. The first is British and comes from E. Newberry, History of North America (London: 1789). The frontispiece is by W.D. Cooper and is called "America Trampling on Oppression". America/Liberty is depicted as the goddess Minerva who is the goddess of war, poetry, music, medicine, and wisdom. Above her head is a spear with intertwined snakes (medicine) and a sword (war). She has her left foot on a wolf's head (the British Empire which had been defeated by the American colonists in the Revolutionary War); next to her right foot is an overturned cornucopia out of which is spilling coins (suggesting the bounty that is to come once the Americans are free of British oppression). 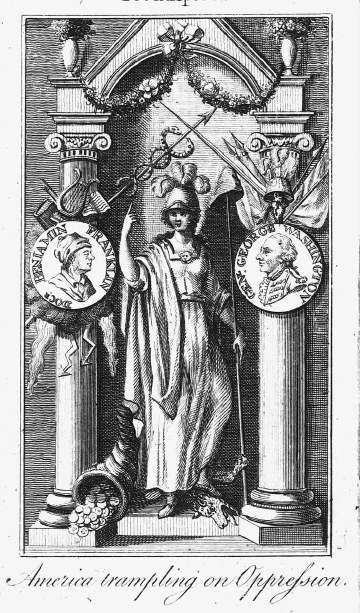 In her left hand she holds a staff with the Phrygian cap of liberty on top; her right arm is held upwards with her index finger outstretched (it looks like she is "giving the finger" to the British Empire!). She is flanked by a pair of Roman columns: on the column to her right there is a picture of Doc. Benjamin Franklin and symbols of science, music, and learning; on her left is Gen. George Washington with symbols of military power. It is interresting that such prominence is given to Franklin and Washington, suggesting that the reason for America's success aginst British "oppression" was a combination of both practical learning (Franklin) and military prowess (Washington). 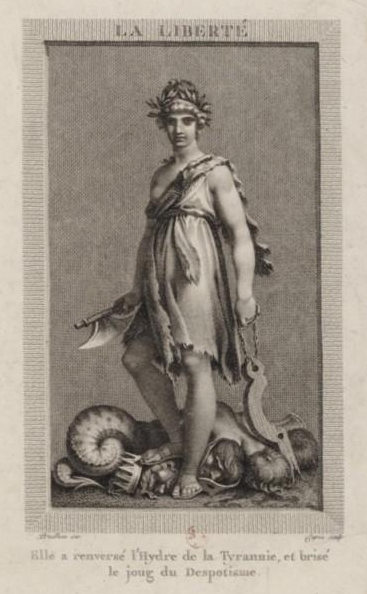 The second is a French engraving from 1793 by the illustrator Pierre Paul Prud'hon (1758-1799) and the engraver Jacques Louis Copia (1764-1799). It shows a rather bedraggled looking Liberty (quite Amazonian in my view and very different from the better dressed Minerva) wearing a rough dress which exposes one breast, and an animal skin tied around her shoulder. She wears a laurel crown on her head. In her right hand she is holding an axe with a very broad blade; in her left she is holding a yoke used to harness a horse or ox to a plough or wagon. Under her right foot is the head of a slain king (despot) with his crown now dislodged; behind her lies a multi-headed hydra (we can see at least three heads) which she has also killed. The hydra was a mythical Greek creature which had nine heads and the body of a serpent. A pool of blood lies between two of the heads. The motto says "She has overthrown the hydra of Tyranny and smashed the yoke of Despotism." What I think is interesting in thes two image is the explicit violence shown in the French in which Liberty herself has killed the king and slain the monster in order to achieve liberty, whereas in the English/American illustration Minerva/Liberty is not shown holding a weapon nor is she in an agressive pose. Although she has her foot on the slain wolf it is not clear who killed it. The implication is that others, like General Washington, did the fighting and killing of the oppressors on her behalf. I think this says a lot about the difference perceptions held by contemporaries of the American and the French Revolutions.